These are the seeds saved from tomatoes locally known in Puglia as pomodori or pomodorini appesi, or “hanging tomatoes.” We found these at Masseria Aprile, an agriturismo farm we visited in Locorotondo last year. 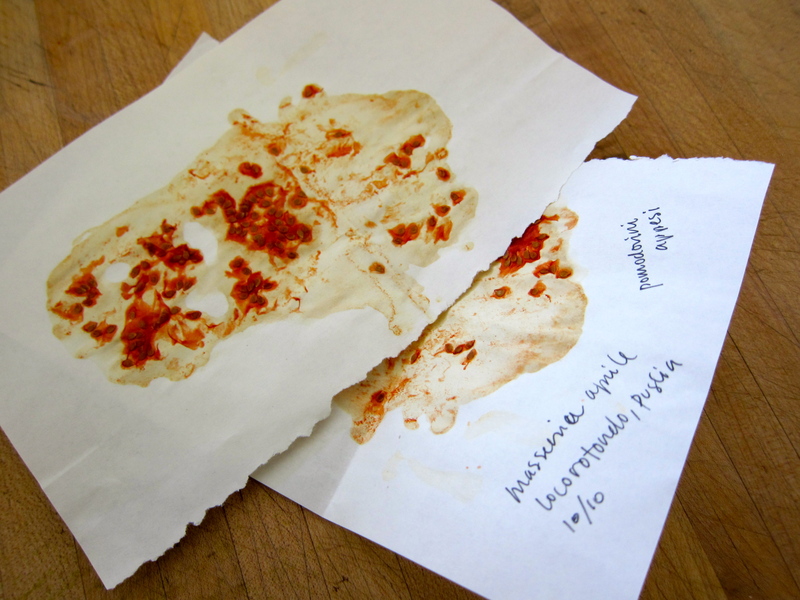 I’d just learned how to save tomato seeds from our friend, John Forti, the quick and easy way — I took several of the tomatoes, cut them open, and emptied the seeds onto some pages torn out of my travel journal. They were left to dry on the window sill of our room for the couple of days before we left, then folded up and stashed in a bag. Did you ever find out what variety it was? They are beautiful! I would love to grow and cook with them! Are They really called Aprile? Can’t find anything under that name. Thanks for visiting, Christina! We call these tomatoes Aprile after the farm in Italy that we got the seeds from. We’ll be returning to Puglia this fall, and hope to find out more about these tomatoes. Seeds From Italy (growitalian.com) has seeds for the Ponderosa sel Oro, the closest we’ve found to the Aprile. Another variety that might work is the Principe Borghese. I will be anxiously waiting of your return….hopefully with a name, source, or some seeds!! !lol I am now obsessed with these things! So that’s how this started! Pretty & interesting from the beginning. The page on top if framed could pass for a piece of abstract art.